The companies most likely to thrive in the complexity, speed and uncertainty of today’s global business environment are those who are able to innovate effectively. This increasingly calls for firms to be ready to collaborate beyond their own walls. Companies cannot afford to rely entirely on their own research, or assume that all the best ideas can be generated internally. As Bill Joy of Sun Microsystems famously commented “No matter who you are, most of the smartest people work for someone else.” The wisest business leaders are those seeking to work with others, and looking for partnerships in innovation. In sectors like food and drink and FMCG, forward-thinking companies have been identifying opportunities to create value, by challenging a rigid insistence on traditional ‘closed’ approaches to R&D. A closed approach would emphasise confidentiality over openness, and internal capabilities over external strategic partnerships. Open Innovation refers to a broad approach that offers a bright alternative. The term ‘Open Innovation’ was coined by Henry Chesbrough, then at Harvard Business School. It provides an alternative model to the conventional funnel for new product development, in which companies invest heavily in research, taking a subset of those projects through to development, and a further subset through to commercialisation and market launch – a process which is slow, expensive, and fraught with risk, and often leaves good ideas behind (perhaps mistakenly) if not deemed sufficiently lucrative. Instead Chesbrough advocated OI “to accelerate internal innovation, and expand the markets for external use of innovation.” He identified ‘inward-out’ and ‘outward-in’ flows of knowledge. The figure below depicts the open innovation funnel. 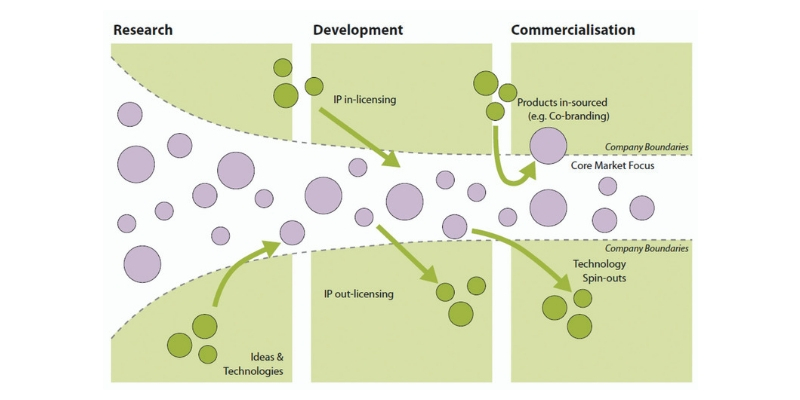 The boundaries of the firm, represented by the dashed lines of the funnel, are permeable and allow ideas and technologies (the mauve and green circles) to pass in and out of the firm. Building on OI research by the IfM’s Professor Tim Minshall and Dr Letizia Mortara, the Open Innovation Forum has developed over the past nine years with companies in the food and drink and FMCG sector coming together to share OI best practice, explore hot topics, and engage actively with research. Members include industry-leading multinationals such as P&G, Walgreens Boots Alliance, Mars, Moy Park, Crown, Siemens, Domino, Heineken and PepsiCo among others. They span different echelons of the supply chain - manufacturers, raw materials and packing producers, machinery and ingredients suppliers, and retailers - enabling development of insights along the entire value chain. The Forum’s Roadmap, a powerful sector-specific tool used and updated by the members to identify key issues and trends, provides topics for focus at meetings. Workshops are held three times a year, hosted by a different member each time. Recent themes have included supply chain security, flexible batch manufacturing, intellectual property strategy, and plastic packaging. While broad underlying industry needs tend to remain the same - sustainability, health, productivity, quality - the strategies for achieving them and hot topics within them shift over time. A key element of the Forum’s work is the critical self-evaluation members undertake of their company’s current OI approach, enabling them to analyse their own strengths and weaknesses. This is also valuable for seeing trends and comparisons across the group, opening up discussions on different ways to address challenges and drive improvements. The opportunity to learn from the collective experience of the group, combined with research input and frameworks from the IfM, has become a significant asset to members. Often strategies vary between companies. There are times when a more traditional approach to innovation is more appropriate, and companies may choose to keep certain areas ‘closed’ – for example when dealing with deep know-how that is important to the business, such as a secret recipe. Dr Serena Flammini at the IfM is currently working on further research to identify tools to support businesses in making decisions about when ‘open’ or ‘closed’ innovation is more appropriate. OI can take many forms in practice. An example may be increased collaboration and information-sharing across an end-to-end supply chain. Traceability is a major concern for FMCG retailers and consumer groups, but the costs can end up falling heavily on one party in the supply chain such as the packaging company. If supply chain partners can find a joined up process to share information without contravening IP or consumer rights, they can all derive value from the ability to provide better data on traceability, thereby benefiting their customers whilst dispersing the burden of risks and costs. Another example is co-creation. Outward-looking companies find proactive ways to encourage innovators to come to them with new ideas. For example, Heineken has created a web-portal called Innovators Brewhouse which communicates challenges and encourages external parties to submit solutions. 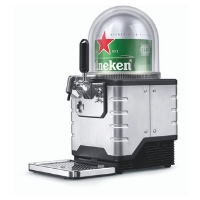 This has produced successful inventions such as the Heineken Blade, a countertop draught beer dispenser, which enables the company to target huge new growth markets for draught in the casual dining sector which can currently only offer bottled beer. Siemens has also recognized the value of working jointly with partners and customers to create new solutions, and has created a co-creation toolset to support the process. One of the Forum’s key aims is to facilitate big corporations to work alongside start-ups and SMEs. Large corporations need access to new ideas and technologies to feed their innovation processes. Small firms are significant generators of innovation but are typically resource constrained. So bringing together these companies in mutually beneficial partnerships harnesses the speed, entrepreneurship and innovative capacity of small firms to feed the channels, brands and resources of the large company, creating new value for consumers they could not deliver alone. The Forum holds an annual pitching contest, an opportunity for start-ups and SMEs to pitch innovations to the members. The combined power of the Forum, with a significant global market share among the members, provides a huge opportunity for smaller enterprises. The contest usually focuses on common challenges identified by the Forum, seeking relevant solutions. Forum members may jointly invest in a new enterprise, which is good news for everyone as it spreads the risk and widens the opportunity for the innovator. This article was written by Dominic Oughton, Principal Industrial Fellow at IfM Education and Consultancy Services. Contact do251@cam.ac.uk. More information about the 2018 Pitching Event on 21 November 2018 can be found here. This article was originally published in the Manufacturer magazine - the original article can be found on their website.